It is an exaggeration to say that Plato and Aristotle are recognized as the founding fathers of pattern recognition. There are hardly references to them in the text books and review papers. Nevertheless, it is my strong opinion that understanding the basis of their philosophical discussion is a big help in understanding the scientific basis of pattern recognition. In the previous discussions on the knowledge and observations and on the four approaches to pattern recognition we touched already their approaches. Plato was initiated in Egypt. He is engaged with the esoteric world. His thinking starts with ideas, with concepts, with the spiritual elements. His struggle is to bring them down to earth, to physical observations. Aristotle never visited one of the esoteric schools. He was Plato’s student, but developed his own philosophy that starts with the physical observations. His struggle is to combine these observations and to generalize them to rules. In contrast to Plato he is searching, perhaps even creating the proper concepts. In short, Plato has the concepts, but is in need for formulations and observations that can relate them to the physical world. Aristotle observes the physical world and is in search for concepts that generalizes them. A debate between these two people may be very fruitful, like the two philosophers in the School of Athens in the above picture, a part of a painting by Raphael in the Vatican Museum. Looks at where their hands point to. The older philosopher, possibly representing Plato, points to heaven, the world of ideas and concepts. The younger friend points to the world, to where he finds the observations. The two poles, represented by Plato and Aristotle, can be found everywhere in science. Theoreticians need experimentalist to verify their hypotheses. Experimentalists need theoreticians to put their observations into the general framework of the laws of nature. In scientific publications these two lines can be distinguished: theories in need for a verification, or observations in need for an explanation. These are the ways knowledge growth, top-down or bottom-up. Pattern recognition contributes to this process by the development of specific tools. The top-down approach, the Platonic way, is studied by structural pattern recognition in which general concepts are logically related by rules or graphs. It is the challenge to relate them to measurable observations. The bottom-up approach, the Aristotelian way, is studied by statistical pattern recognition, in which given observations have to be generalized to rules and concepts. 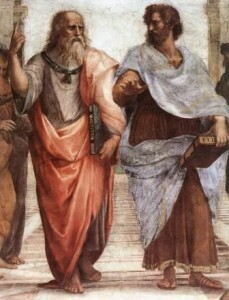 The debate between Plato and Aristotle is reflected in pattern recognition by the several attempts to bridge the two approaches. The difficulties are the question how to find the observations that support or specify a given conceptual framework, and, from the other side, how to transform a generalization of measurements into a, for human experts meaningful concept. Well-known studies in this direction are published by Fu , Goldfarb , and Bunke . We tried to contribute to this debate by our studies on the dissimilarity representation for pattern recognition , . It is interesting to note that the two Technical Committees of the IAPR, the International Association for Pattern Recognition, TC1 and TC2, responsible for these two approaches, decided in 1998 have their workshops together. L. Goldfarb, A new approach to pattern recognition. In: L. Kanal, A. Rosenfeld (Eds. ), Progress in Pattern Recognition, vol. 2. Elsevier, pp. 241–402, 1985. L. Goldfarb, O. Golubitsky, and D. Korkin, What is a structural representation?, Faculty of Computer Science, U.N.B., Technical Report TR00-137, December 2000. 4. H. Bunke and K. Riesen, Towards the unification of structural and statistical pattern recognition, Pattern Recognition Letters, vol. 33, no. 7, pp. 811-825, 2012. E. Pekalska and R.P.W. Duin, The Dissimilarity Representation for Pattern Recognition, Foundations and Applications, World Scientific, Singapore, 2005, 1-607. R.P.W. Duin and E. Pekalska, The dissimilarity space: between structural and statistical pattern recognition, Pattern Recognition Letters, vol. 33, no. 7, 2012, 826-832.